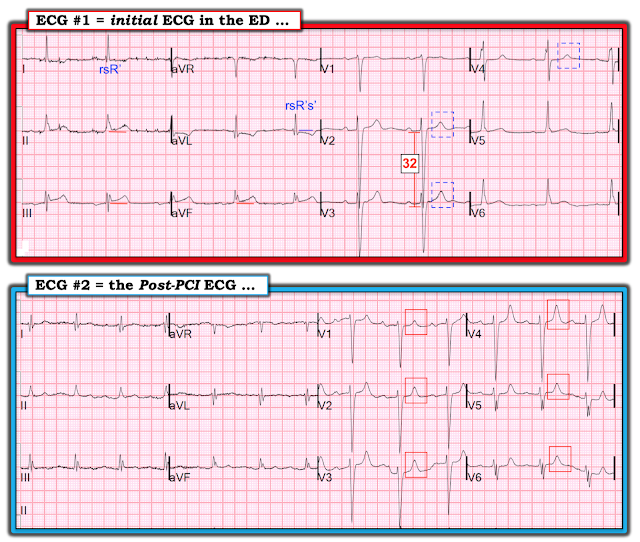 Dr. Smith's ECG Blog: IVCD, Saddleback STE in III, with reciprocal STD in aVL: Is it pseudoOMI or OMI? Echo with Speckle Tracking gives the answer. A 77 y.o. woman with a history of hypertension and congestive heart failure presented for acute onset chest pain and shortness of breath. She stated that she woke up in the morning with a central chest pressure with associated shortness of breath. She had been feeling well the day before. She had no h/o CAD but had a history of "unspecified cardiomyopathy"
No old EKGs or angiogram were available. There is ST elevation in inferior leads, with reciprocal ST depression in aVL, so one must strongly suspect acute inferior MI. My response was that the diagnosis of inferior OMI is probable but not certain. I was looking at it on my phone when I gave that opinion; looking at the full size version I am more convinced of OMI than I was at the time. The emergency physicians were also not certain. This one was done with Speckle Tracking Strain Echocardiography. The lavender line is associated with the lavender sector where it says "inferior". That sector is clearly not moving as well as the upper right. But you don't have to depend on your Gestalt. You can see the graph. The deeper the graph (deepest is yellow, which is anterior), the better the contraction. The lavender sector contracts less than 10 on the scale, so there is indeed an inferior wall motion abnormality. You might wonder why the inferior wall looks so medial. The location depends on the operator who tells the machine what wall is what by placing dot markers on the endocardium. So if the inferior wall is not accurately marked, it will identify the wrong wall. Rowland-Fischer A. Smith SW. Laudenbach A. Reardon R. Diagnosis of acute coronary occlusion in patients with Non–STEMI by point-of-care echocardiography with speckle tracking. American Journal of Emergency Medicine 34(9):1914e3-1914e6; Sept 2016. Here is the case we describe in the report: Ultrasound Before ECG for Chest pain? Whoever gets there first. Use of Speckle Tracking. The resident wrote that the cath showed only an OM occlusion. "Could an OM occlusion cause an inferior MI?" "Could the EKG abnormalities be baseline and he really had an occlusion that did not manifest on the EKG?" In a left dominant system, an OM could supply the inferior wall, but that would be unlikely. In this case, due to the EKG abnormalities, it is likely. But the proof would be in the subsequent ECGs: did they evolve? If the EKG abnormalities are a result of the ischemia, the ECG will always evolve. The ST segments will resolve, or there will be T-wave inversion, or both. --So this OM does indeed supply the inferior wall. RCA supplies PDA only, normal. PTCA of LCx OM2 branch performed. Distal vessel difficult to visualize. Flow eventually restored after multiple passes with thrombectomy aspiration catheter. Therefore the ECG abnormalities were definitely a result of the ischemia. Moderate to severe decrease in left ventricular systolic function with an estimated EF of 30%. Regional wall motion abnormality--apical septal, mid anteroseptal, mid to apical anterior, and apical lateral hypokinesis. Regional wall motion abnormality--basal to mid inferior and inferolateral hypokinesis. There are a number of reasons why I really like this case: i) As per the title chosen by Dr. Smith — it’s a great example of how combined use of ECG + Echo with Speckle Tracking makes the diagnosis; ii) It illustrates some important points about ECG assessment when the initial ECG shows an unusual form of intraventricular conduction defect (IVCD); and, iii) It shows how the follow-up (ie, 2nd) ECG confirms the diagnosis. 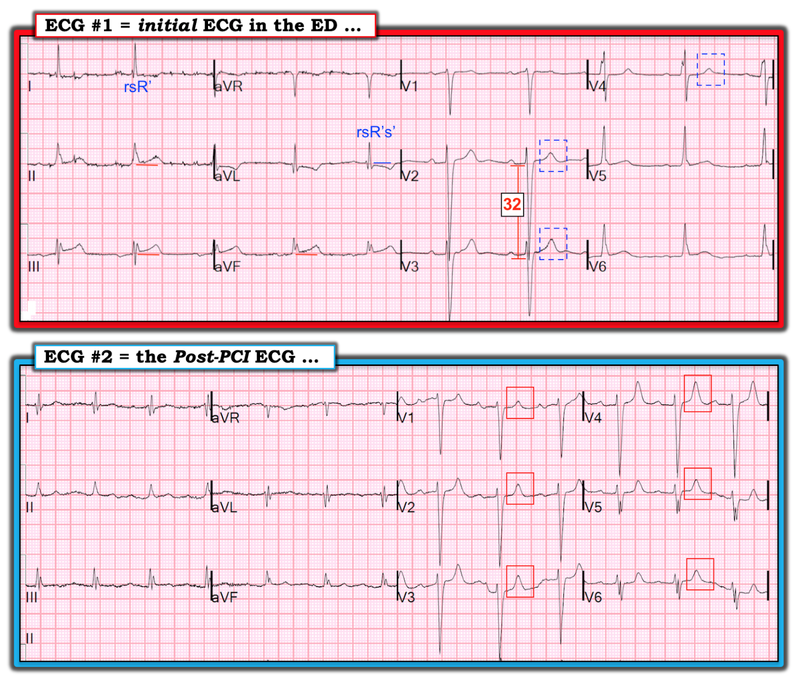 Figure-1: The 2 ECGs shown in this case (See text). COMMENT: As per Dr. Smith, it’s important to emphasize that in this older patient with underlying heart disease and new-onset chest pain — acute OMI must be assumed until proven otherwise. That said — I was initially less certain of this diagnosis from inspection of ECG #1 alone, without the benefit of a prior tracing for comparison ( = My Opinion). In favor of acute OMI until proven otherwise from ECG #1 — all 3 inferior leads show subtle-but-real ST elevation — and, there is mirror-image opposite reciprocal ST depression in lead aVL. I’ve added horizontal RED and BLUE lines to these leads to facilitate recognition. My reservation about whether or not these changes were acute stemmed from how atypical the IVCD in ECG #1 was. This patient clearly has underlying structural heart disease — and that can affect ST-T wave appearance appearance in a way that is hard to determine without seeing a baseline ECG. The QRS complex is wide. Although the QRS does not look overly wide in a number of leads — one takes the widest QRS that you are clearly able to see for measurement of QRS duration, and I measure 0.12 second for QRS width in leads V2 and V3. Therefore, there is a conduction defect. However, the triphasic ( = rsR’) complex in lead I (quadriphasic in lead aVL) is distinctly atypical for LBBB — as is the narrow R wave in lead V6. Typical LBBB also does not produce a 6mm R wave as early as lead V2, as we see here in ECG #1. This defines the conduction defect in ECG #1 as a nonspecific IVCD — because it does not conform to either typical RBBB or LBBB. Assessment of ST-T wave changes, as well as chamber enlargement is often more difficult in the setting of IVCD. (NOTE: I did not say “impossible” — but I did say that it’s often more difficult to assess acute ST-T wave changes in the setting of an unusual IVCD, such as the one we see here). As per Dr. Smith — there is also LVH in ECG #1, and the presence of LVH can be a confounder for recognizing acute MI on ECG. I will emphasize that ECG criteria for diagnosis of LVH are different, and often much more difficult to ascertain in the presence of any conduction defect (RBBB, LBBB or IVCD). This is because the sequence of both ventricular depolarization and repolarization is altered when there is a conduction defect. As a result — recognition of ST-T wave changes of LV “strain” is less reliable — and, the usual numerical criteria established for ECG diagnosis of LVH are different and not well established. That said — the finding of very deep anterior S waves (ie, ≥25-30mm in V1, V2 or V3) has been correlated with high statistical likelihood of LVH. This criterion is met by the 32mm S wave in lead V2 of ECG #1. Finding a prior ECG on this patient would have been invaluable for proving that the limb lead changes in ECG #1 were acute and not longstanding. Unfortunately, a prior ECG on this patient was not available. This highlights the value of Echo in the ED — with demonstration of a localized wall motion abnormality confirming the need for immediate cath (Our THANKS to Dr. Smith for these beautiful Speckle Tracking Echo videos! ). As per Dr. Smith — the inferior lead ST elevation and reciprocal ST depression in lead aVL has resolved in ECG #2. NOTE: QRS morphology in leads I and aVL in ECG #2 is even more unusual than it was in ECG #1 — in that both leads I and aVL now show quadriphasic (rsR’s’) complexes, with a near isoelectric deflection. Extra-notched QRS complexes (ie, fragmenting) — is also seen in leads III, aVF; and in the S waves of leads V5 and V6. Such fragmentation often indicates “scar” — either from underlying cardiomyopathy, prior infarction or both. It should be appreciated that R wave progression is markedly different in ECG #2, compared to ECG #1. That is, transition (where the R wave becomes taller than the S wave is deep) occurred between leads V3-to-V5 in ECG #1 — but it never occurs in ECG #2 (ie, the S wave remains predominant through to lead V6 in ECG #2). I would generally not expect this marked change in R wave progression to be the result of reperfusion — which raises the question of whether chest lead electrodes were placed in the same position when recording both tracings? Awareness of this difference in R wave progression is essential when attempting to compare serial ST-T wave changes! That said, despite this marked difference in R wave progression between these 2 tracings — there should be little doubt that there has been evolution of the ST-T wave. Note the much more modest T wave amplitude (within the dotted BLUE rectangles — with tiny, almost flat T waves in the other leads) in ECG #1. In contrast — the T waves in all chest leads of ECG #2 are clearly more peaked and manifest a narrower base (within the RED rectangles). I interpret this difference as showing evolutionary reperfusion ST-T wave changes — that add further support to the acuity of the findings we saw in ECG #1. Our THANKS to Dr. Smith for providing this superb teaching case! Dr Smith, for those of us in the prehospital setting without access to POC ultrasound, do you think a complete right sided EKG would have proven much benefit in reducing the equivocal nature of the baseline tracing? The clinical symptoms, and history, alone certainly tip the scales in favor of OMI. I try to contextualize this from the perspective of convincing the nearest PCI center that we're (EMS) inbound with a legitimate cath activation. In retrospect, a right side ECG would not have helped, as it was not an RV MI. Even prospectively, it would be unlikely to help, as in the absence of STD in V2, an RVMI would reveal itself in V1. And if it does NOT reveal in V1, only a few percent would reveal themselves in V4.....This is inferior OMI until proven otherwise, so transport to the nearest PCI facility! St elevation in lead 2 is almost equal to lead 3; with less st elevation in aVL and st elevation in V6; do they not suggest LCX occlusion ? In this case; PDA is from RCA; so PDA and OM they both serve inferior wall ? Is there any significance of RSR pattern in lead 3/inferior leads ? Methods of determining infarct artery are not very good, except for STE in V1 (RV MI, which implies RCA). In this case, there is STD in I and III > II, so not helpful. You sure have to use imagination to see STE in V6, and maybe this is telling. However, it doesn't really matter prospectively what artery it is. It only matters whether you need to activate the cath lab or not. I see your point. I wanted to know about the culprit artery only for academic purpose.